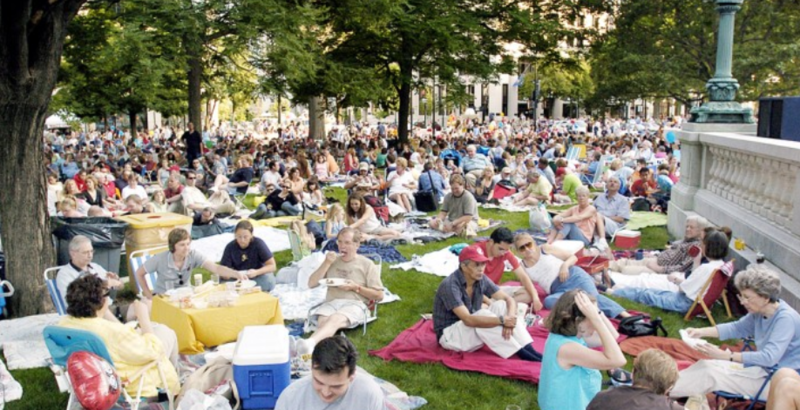 NEW this year … Jazz at Five patrons can seat on the lawn of the Wisconsin State Capitol. Unlike State Street which is part of the City of Madison, the Capitol lawn is a State Park. Attendees on the lawn can bring their own beverages and food to this area, much like “Concerts on the Square.” This is a new privilege for Jazz at Five, please be respectful. If you are seated in the reserved table area, Jazz at Five provides table service. Reserved tables offer additional comfort, great sound/sight lines, and additional amenities such as food and beverage service. This is a great way to entertain clients and friends while enjoying Jazz at Five in style. No food, alcoholic beverages or beverages in glass containers may be carried in. All net proceeds from Capital Brewery beer sales are donated to Jazz at Five. In accordance with performer contracts, audio and video recording of Jazz at Five performances are prohibited. If you have questions or need assistance while attending Jazz at Five, please visit the onsite Information Booth to talk with a volunteer. Jazz at Five volunteers will also be walking among the crowd with red volunteer Jazz at Five shirts—please don’t hesitate to ask for assistance.